Hello lovelies, today I have for you a review of this amazing bubble wand and also a little clip of us using it, my boys loved it! This is a motorised bubble wand that creates enormous bubbles, I couldn't believe the size of them when they was coming out they was huger than our heads combined! Oscar was a popping machine and Lawson was in ore of them blowing all around. It has its own special formula to create the giant bubbles and plenty of them, the gazillion collection is amazing, Oscar already wants all of it after trying this. I don't think you can ever be too old for bubbles there is just something about it, I had loads of fun with this, I love watching them float into the air or watching my child run around blowing of steam popping them. It's really easy to use with just a press of the button, all you have to do is pour the solution into the tray that it comes with, place the wand into the solution then press the button and voila giant bubbles come out. 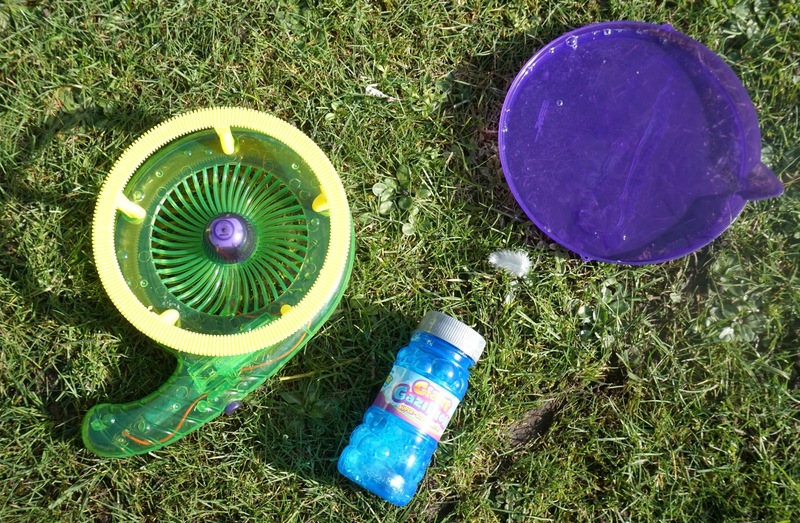 We had loads of fun running with it also as it was a really windy day so we created lots of bubbles. You get a free 8oz solution bottle with this but you can also buy them in litre bottles! I shall be getting some litre bottles over the weekend to have lots of fun for when the weather picks up. We are going to have so much fun in the summer months with this especially the easter break and the six weeks holidays, Lawson and Oscar loved it as you will see in our video clip below. You can buy these at Argos and they are so reasonably priced for the hours of fun you can have with it, you and your kids will love it.